Las Flores is the place where you find out what life is (supposed) to be made of. There is no "back to reality" - this is your reality. You get to live life on your terms. You make the rules you operate by - if that's 9-to-5 or a nice balance of work and play, it's up to you. We encourage creativity, play time, movement, good food, good cooking, and a lot surfing. You'll make friends you don't yet know exist. You'll find happiness you didn't yet know could be felt. And you'll find a home with us, far from where you might describe your current "home." There is no time to waste, only time to spend doing exactly what you want. Let us help craft that life for you. Nike Trainers Jason Loebig & Bret Gornik will lead you through athlete-based training workouts on the beach that help you get strong, move better, and feel better. Daily morning yoga sessions are led on the rooftop deck overlooking the ocean. 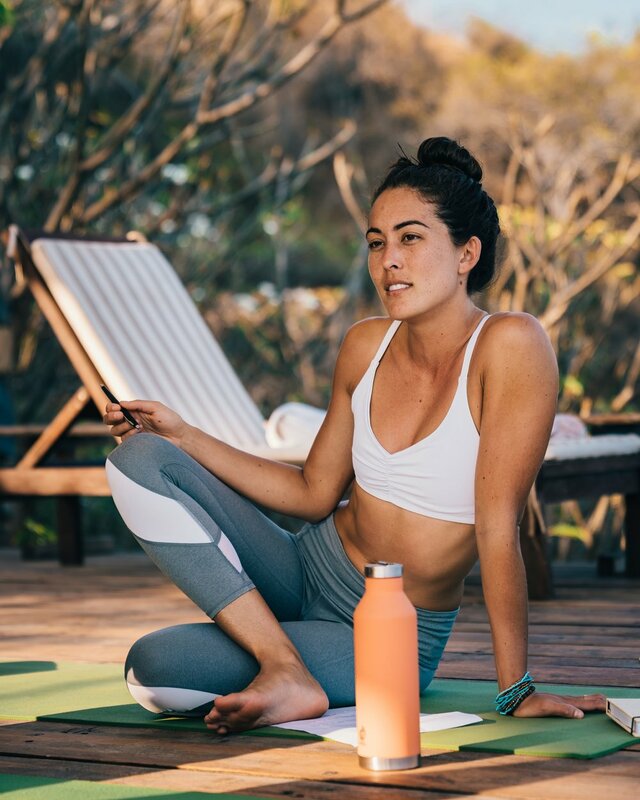 The mix of an incredible view, breeze, nature sounds, and the best vinyasa flow you've ever had create an intoxicating, life-changing experience for your breath, health, and mental clarity. Managed by surfers for surfers, Las Flores' signature break is a world-class, 300-meter-long, right-going freight train that forms outside the point and peels across the cove up onto the sand just meters from the front of the hotel. The epic location of the Las Flores Resort directly in front of the wave is without rival. With multiple breaks to choose from, this surfing mecca provides waves for all ability levels, both beginners and experienced surfers alike (no surfing experience necessary!). Every retreat participant gets a one-on-one coaching session with either Jason or Bret. Coaching sessions will be pre-coordinated in advance to tailor the content to your wants and wishes. Want a personal training session? Private yoga? Life coaching? Business consulting? Jason and Bret will work with you to develop a passion, talk about life or business, and take your health to the next level, whether that means you're training for your first 5k or raising capital for your start-up. With discipline comes freedom. Learn how to optimize your day by developing a morning routine. Our goal is to help you "jump" out of bed to do something you want to do, rather than something you have to do. Yes, this applies to "non-morning persons" just as much as it does the coffee connoisseur who can't wait to start their day. Vitamin D + the perfect morning = the best day ever. This retreat experience invites you to look introspectively at the life you're living. It is, after all, your life. We want to help you find and develop your passions, through the lens of health and wellness. With good health, you can be the best at anything you want to be in this life. Pair that with on-demand creativity...a recipe for great success in your career and pursuit of happiness. "I travel the world for a living, but the Live Better retreat has been one of my favorite experiences of all time. From the physical explorations, to the workshops, to fine-tuning the rhythm of our day to day life, the El Salvador retreat left me feeling inspired, balanced, and fully capable of creating the life I envision. I'm beyond grateful to these guys - they started me on a path that has truly led to living my best days ever." Any further questions? Please email us directly at ham@livebetterco.org for more information! The price of the retreat includes all-inclusive food, beverage, surf lessons, retreat curriculum (e.g. yoga, meditations, workouts, workshops), hotel room, and transfer to and from the resort! Flight and incidental purchases made while traveling, such as food, gifts, etc., as well as massages purchased while at the resort. Live Better would be happy to assist any retreat participant with picking an appropriate flight! Avianca Airlines provides several direct flight options from major US cities, including Chicago, NY, Miami, LA, San Francisco, Houston, and from Toronto, Canada. No, airfare is not included. Please let us know if you would like assistance in choosing a flight! What is the surfing/yoga level? Both the surfing and yoga is designed to fit all skill levels! Whether you’ve never been in the ocean before, or you are Kelly Slater, Las Flores has waves that will cater to your ability level. Catch your first wave ever, or re-light that ocean stoke. Our yoga classes focus on movement, breath, and feeling good. All yoga classes, whether you’re a beginner or advanced practitioner, will provide a wonderful experience to connect your body and your mind. We take great pride in designing enriched environments that are optimal for next-level living. Each day there will be a full schedule that includes surfing, yoga, workshops, meditation and family style meals! Our goal is to have every individual on the retreat leaving as the best possible version of themselves. For that reason we do not make any activity mandatory. For example, if we have a workshop scheduled, but you would rather write in your journal on the beach as you watch the perfect surf break in the distance…go for it! No questions asked and zero judgement. The activities and format of the retreat provide tools to live better. We encourage all participants to join each activity, however, we totally encourage you to make the best decision for yourself while attending. It’s all about personal growth! Retreats vary in size, but expect 15-30 people. - Clothes for warm weather. Can I come with a group? Yes, and we encourage you to! Groups of 2 receive a discount, groups of 3+ receive a bigger discount. Las Flores is a luxury, boutique resort, and the rooms look the part! All rooms have WiFi, air conditioning, bathroom, comfortable beds and a beautiful deck. We have arranged for private transportation to pick you up at the airport and transport you to Las Flores. As you leave customs, exit the airport to the left. A Las Flores representative will be holding a “Las Flores” sign - this is your driver. Please do not take any taxis. The ride from the airport to the resort is roughly two hours. We highly recommend reading The Alchemist on your journey in! Please plan to arrive at El Salvador International Airport (SAL) by 2pm on November 1,2017. We will have activities curated for the late afternoon/evening on the 1st. The retreat officially begins at 6pm, November 1st. If you are able to arrive earlier in the day on November 1st, you are welcome to! Enjoy a free day of post-travel surf, food, nap, and leisure. Once your flight arrives in San Salvador, complimentary private transportation will be pre-arranged to take you from the airport to Las Flores Resort. It is roughly a two hour car ride to our amazing oasis, so please let us know how we can make your travels more comfortable. Enjoy the drive and prepare for an amazing trip! Closing ceremonies are at 10am, November 5th. You are welcome to book a return flight home as early as you'd like, but we encourage you to enjoy as much El Salvadorian sun as possible - later departure...the better! Thanks for your inquiry! More information coming soon on the first Live Better Retreat, but if you have any questions please send us an email!